Test your speed and hand-eye coordination and improve kicking technique using the Lonsdale kick and punch target stand. It features 4 target paddles that can be moved to face different directions and has a robust, solid base which you can fill with either sand or water for added stability. 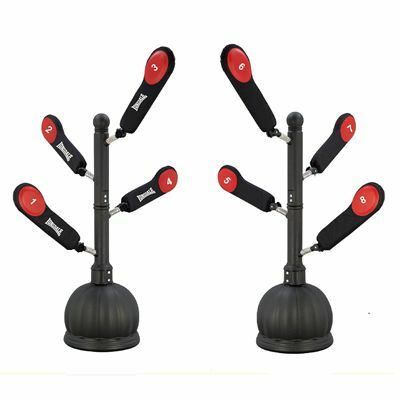 Ready to withstand those heavy punches, the target stand offers a heavy-duty construction and the target areas are numbered from 1 to 8 for combinations drills. for submitting product information about Lonsdale Kick and Punch Target Stand We aim to answer all questions within 2-3 days. for submitting product information about Lonsdale Kick and Punch Target Stand. We aim to answer all questions within 2-3 days. If you provided your name and email address, we will email you as soon as the answer is published. We purchased the kick stand for our Taekwondo club and have been pleased with is so far, We purchased the item as it looked to have a sturdy base which others didn't when doing our research. We have found it sturdy and very useful for training and enabling our students to aim at targets better. Would recommend this product. for submitting product review about Lonsdale Kick and Punch Target Stand.